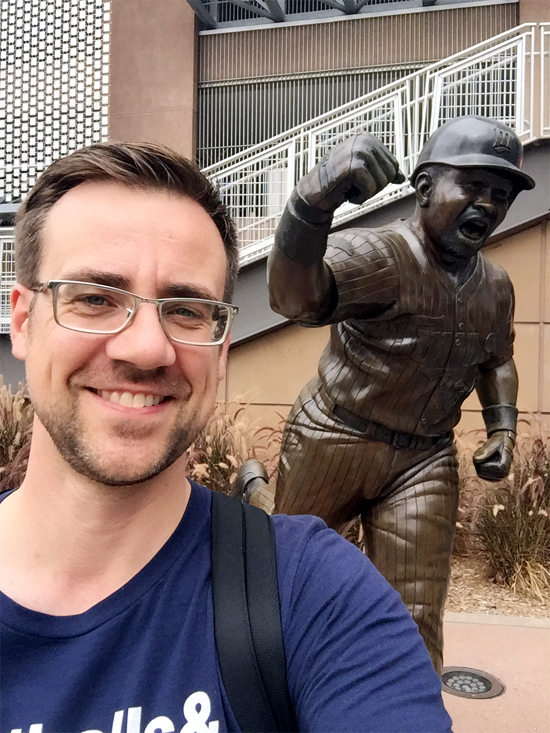 Going into my third visit to Target Field, my mission was twofold — I wanted to make sure to document any sights that I’d perhaps missed on my two previous visits, and to simply chill out for a few innings and enjoy watching some baseball at this gorgeous ballpark. A pretty good to-do list, right? About 10 a.m., I went inside the park and hung out in the outfield seats, taking in the quiet ballpark in front of me on a breezy, sunny and perfect fall day. 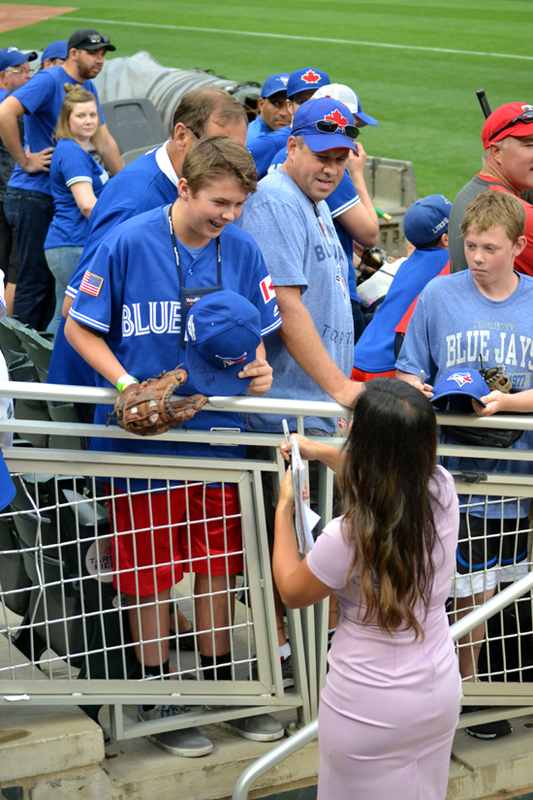 It’s moments like this in which I feel a deep sense of appreciation for being able to travel to so many different cities to watch baseball — and also a deep sense of appreciation for everyone who takes time out of their busy days to read about my ongoing adventures. 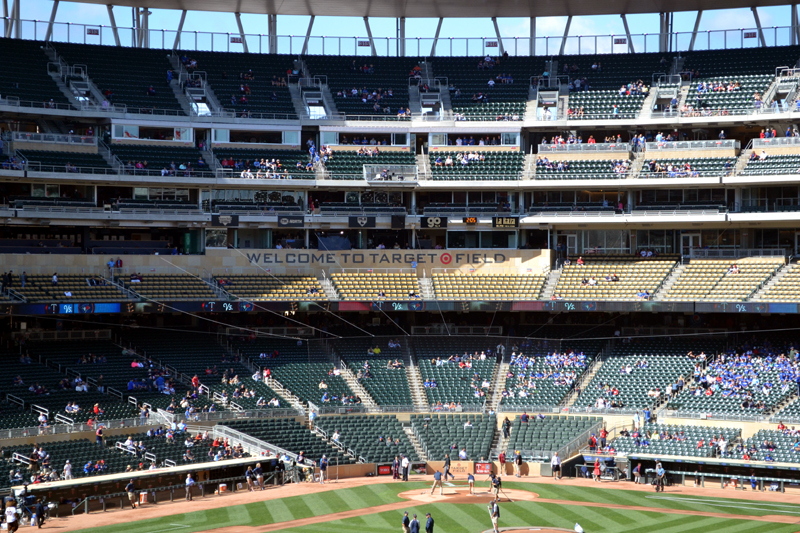 Something that Target Field does really well is break its seating into smaller sections. 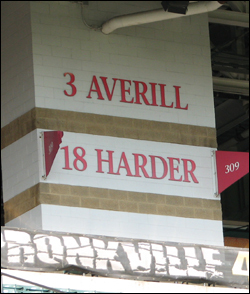 This is common at lots of MLB parks, of course, but I really like how this ballpark does it. I don’t need to break down each of the sections, but I particularly like the yellow seats in the middle of the image. 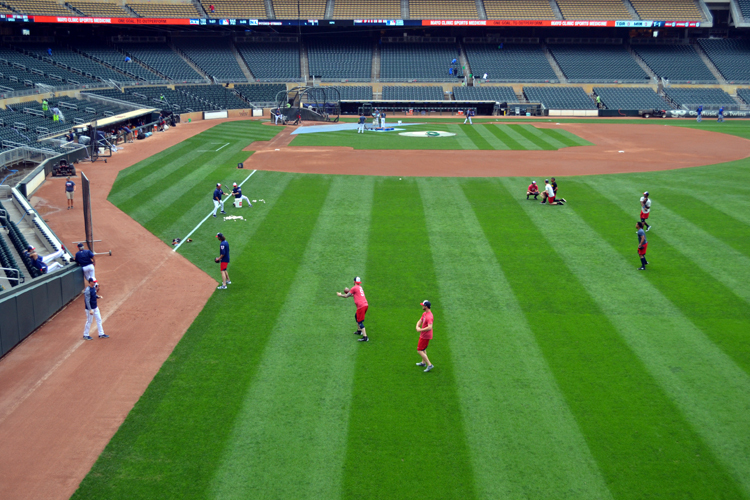 I visited this section a handful of times throughout my three games at Target Field, and I appreciated how close they were to the action, but also how much of a bird’s-eye view of the field they gave you. Accomplishing this balance can be tricky — sometimes, you’re too close to appreciate the whole field and, other times, you’re too far away to see the game’s small details — but these seats, which are technically part of the Delta SKY360 Club, are outstanding. … but also a nice view of the city’s skyline beyond right-center. 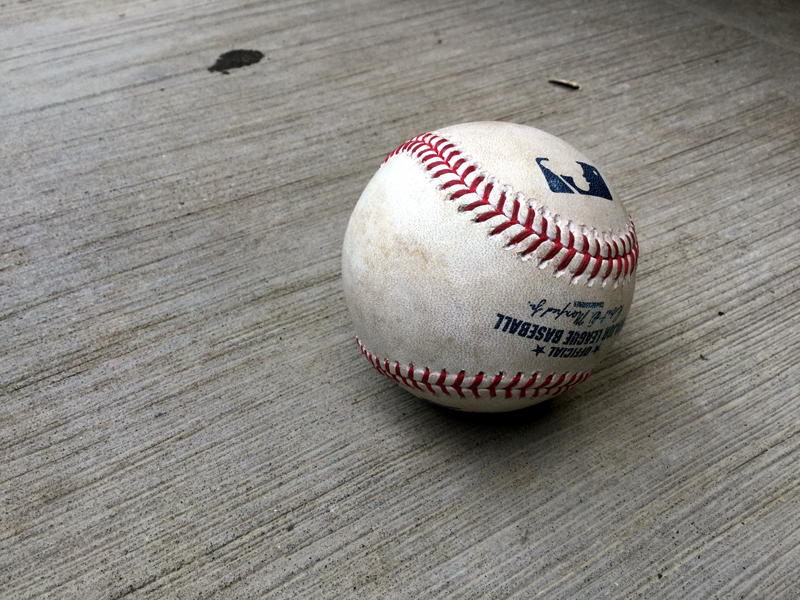 I have to also admit that I chose this area partly because I expected that it might be a good spot to snag a foul ball — and, while a few fouls did indeed come up to this level, they were all a couple sections away from me. Next, I set off in search of something to eat. While highly tempted to get another order of the seafood boil, a fantastic dish that I’d enjoyed a day earlier, I wanted to branch out and find something different. 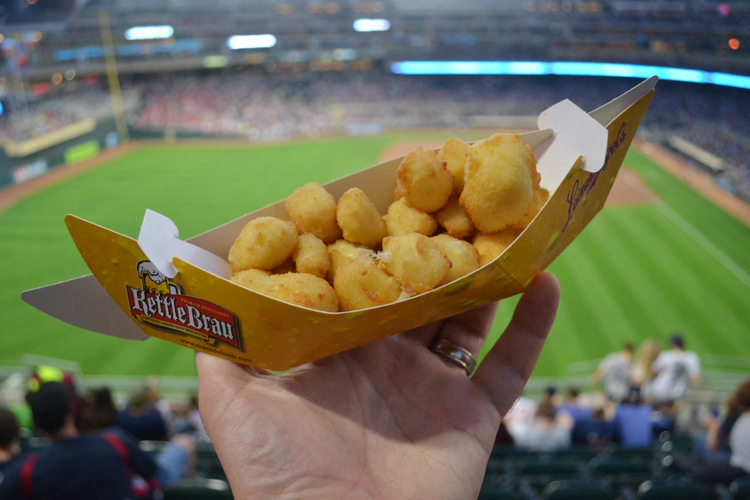 Choosing what to eat during the last game at a particular ballpark can be a bit stressful. (And, yes, I realize this is a colossal first-world problem.) I always want to get something that appeals to me, but there are normally a handful of items that fit this bill — meaning that I’ve got to make the right choice. A dish that had caught my eye a few times was the walleye and chips. It seems funny now, but the use of “walleye” really drew me in. Had the menu simply read “fish and chips,” there’s a 100 percent chance that I wouldn’t have ordered this dish. 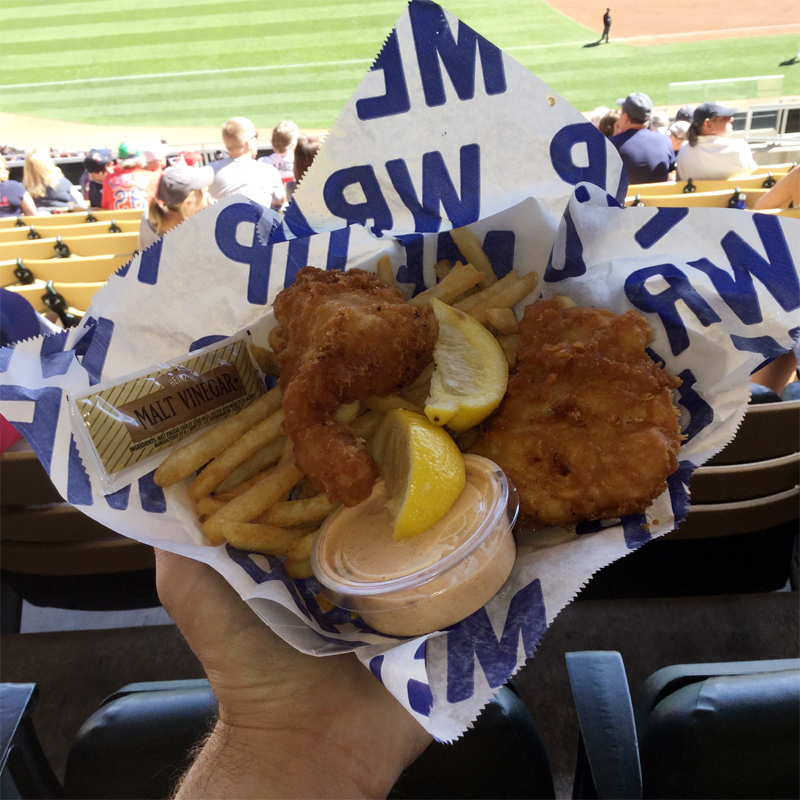 The inclusion of walleye, which is the state fish of Minnesota, made the meal seem a lot more regionally appealing — and it was enough for me to take the bait, so to speak. The meal was good, but basically tasted like any average fish and chips I’ve ever eaten. 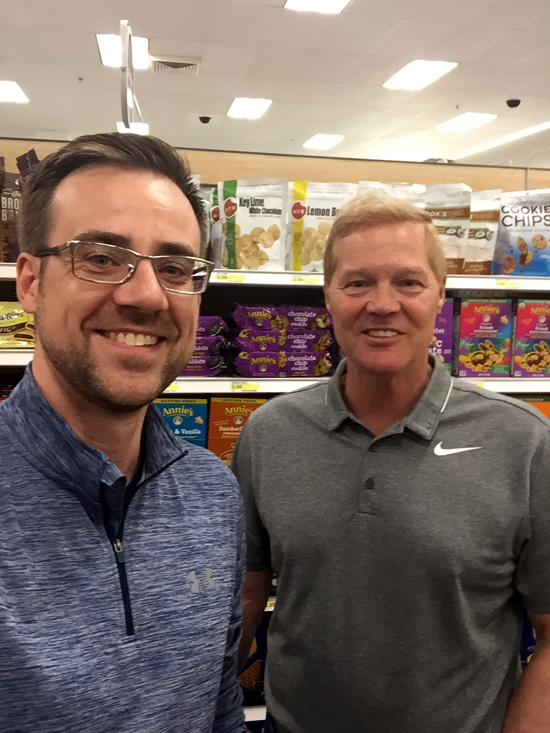 The inclusion of the walleye instead of a saltwater fish such as cod or haddock might have been geographically appropriate, but I certainly wasn’t able to taste anything different about it. I ended up spending the bulk of the second half of the game in this spot. While I usually enjoy wandering around and taking in all the sights, it’s also fun to grab a good seat and just enjoy watching the game. 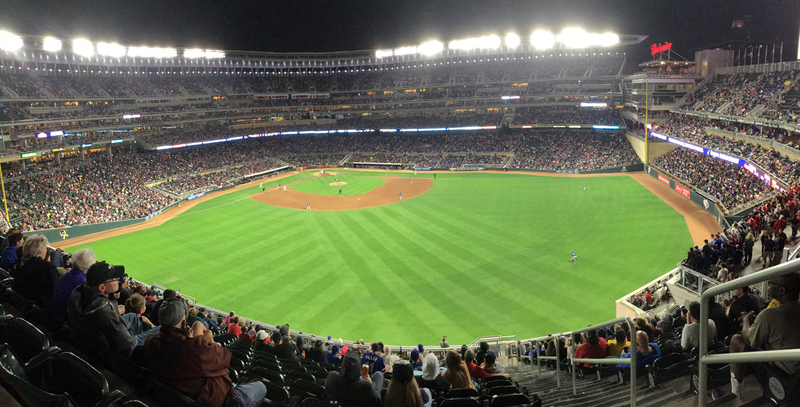 As the game wound to a close, and my third visit to Target Field ended with it, it wasn’t time to fly home just yet. 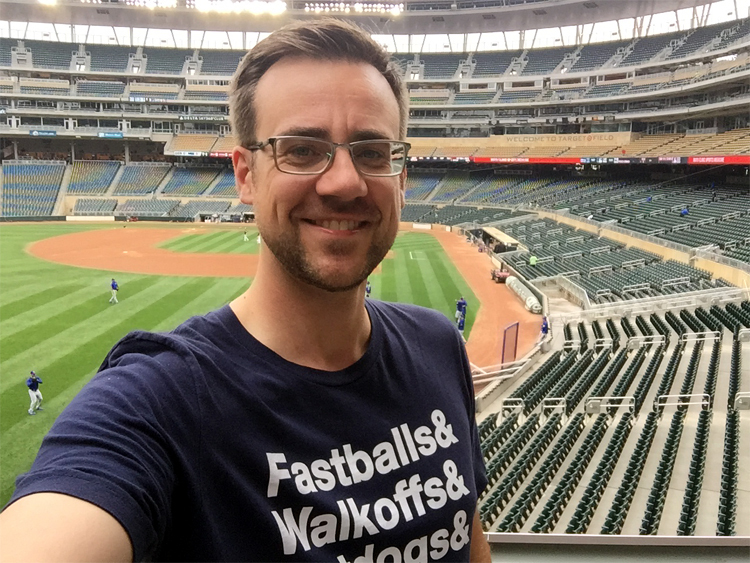 Instead, I’d be spending the final day of my Minneapolis visit getting a chance to tour three of the city’s notable sports venues. After relaxing (and watching some football on that ginormous TV for a bit) I grabbed a sub from Jimmy John’s, which I could see out my window, and then returned to my room to eat, watch Sunday Night Baseball, and then head to bed in excitement of the next day’s adventures. 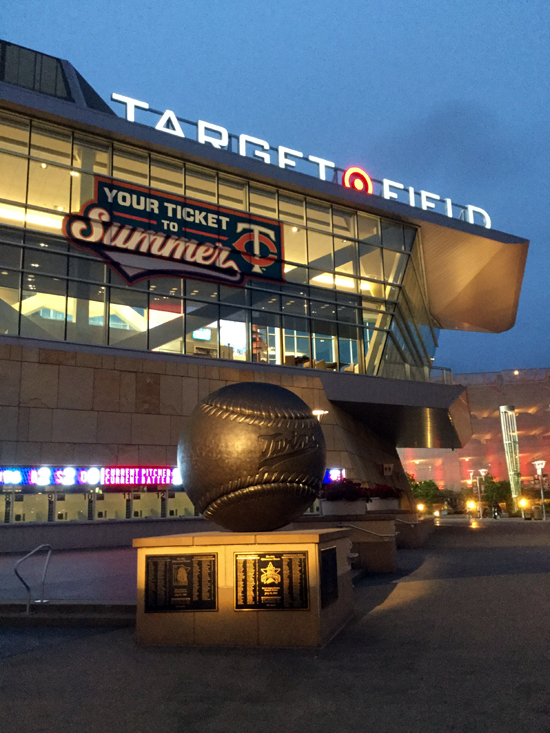 I’m an early riser at home, and that holds true on my baseball trips, too. The way I see it, there’s very little point in lying in bed when I’m in a new city filled with interesting things to see and do. 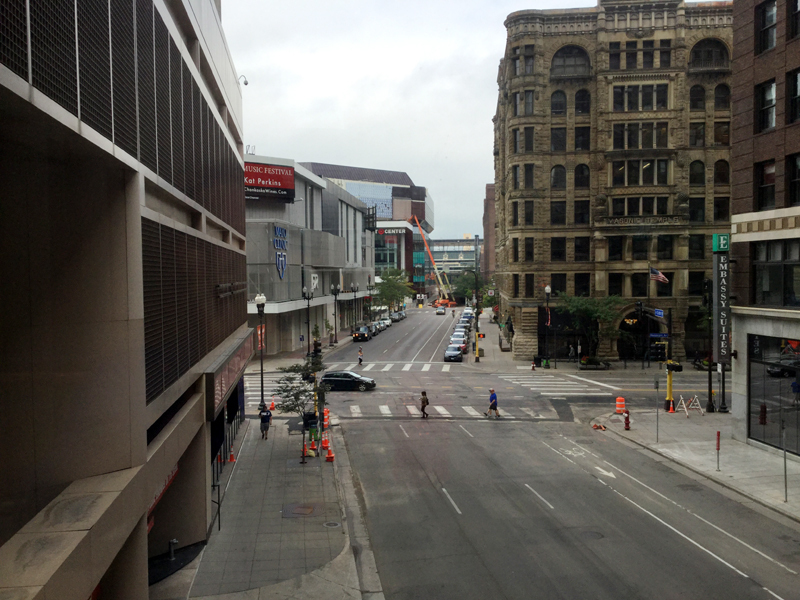 All that to say, I was up good and early on my second day in Minneapolis and eager to get things started. I decided to begin my day with a walk around the city’s downtown. 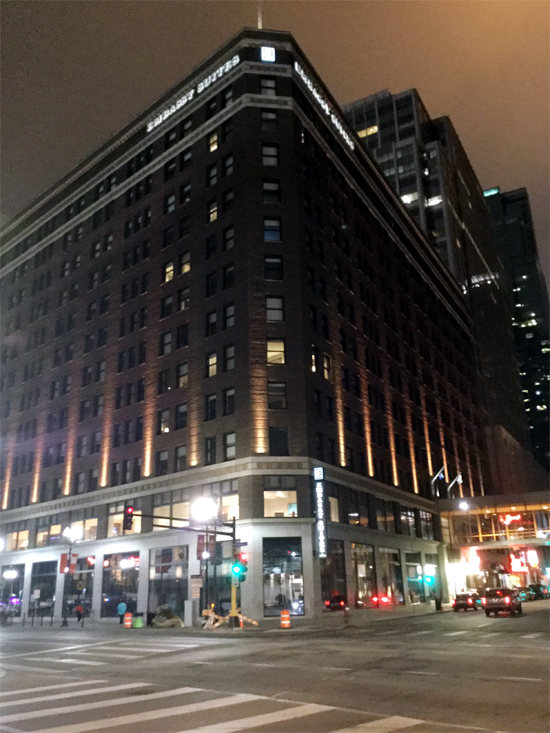 One of my favorite things about Minneapolis is that you can get virtually anywhere downtown on foot, all without going outside. 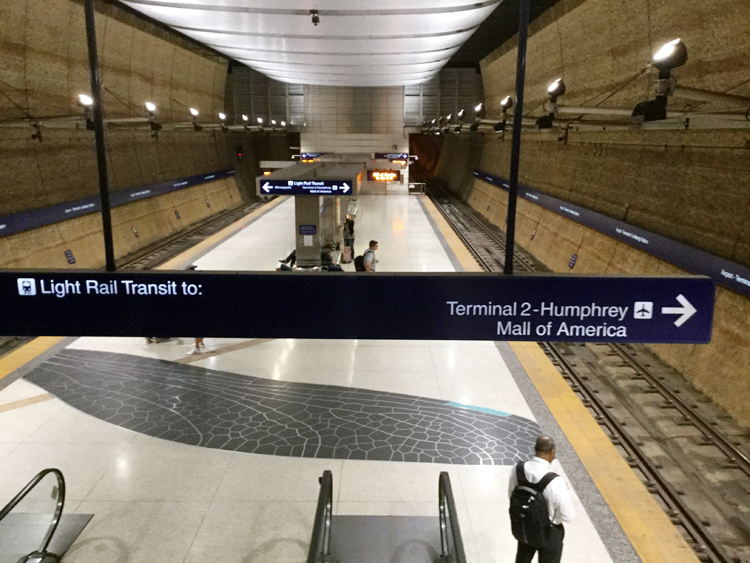 Nothing against fresh air of course, but the Minneapolis Skyway System quickly became a hit for me. It’s a network of enclosed pedestrian bridges and walkways that link up the buildings over 80 (!!) city blocks. It’s the biggest system of its kind in the world, and I found it exceedingly handy and exciting to use. After walking for about 45 minutes, all without going outside, I made my way back to my hotel and had breakfast. 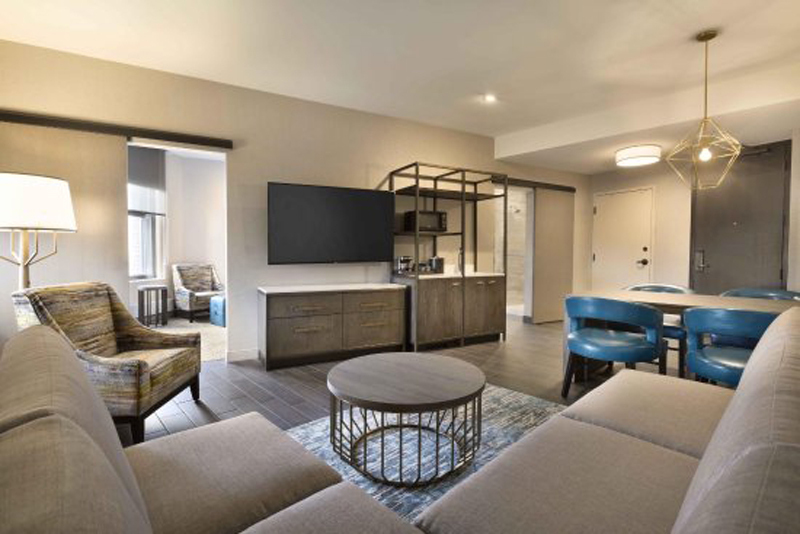 One of the things that I really like about the Embassy Suites brand is that breakfast is included with your stay, and it’s outstanding. Each of the four days of my stay, I had ready-made omelets for breakfast, among other things, to ensure that I’d be properly fueled for my adventure. This is a popular gate for the fans who arrive via light rail, and there are a lot of them. 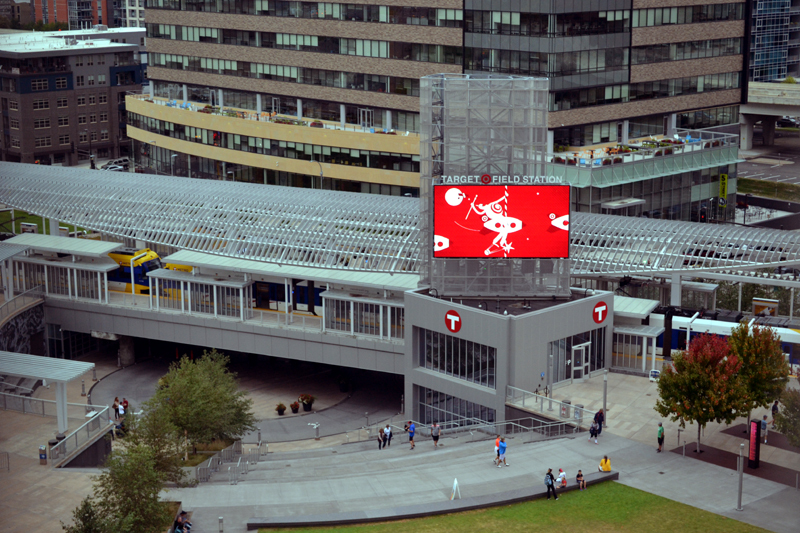 Up the hill on the right side of the above image is Target Field Station, one of the stops on Minneapolis’ light rail system. 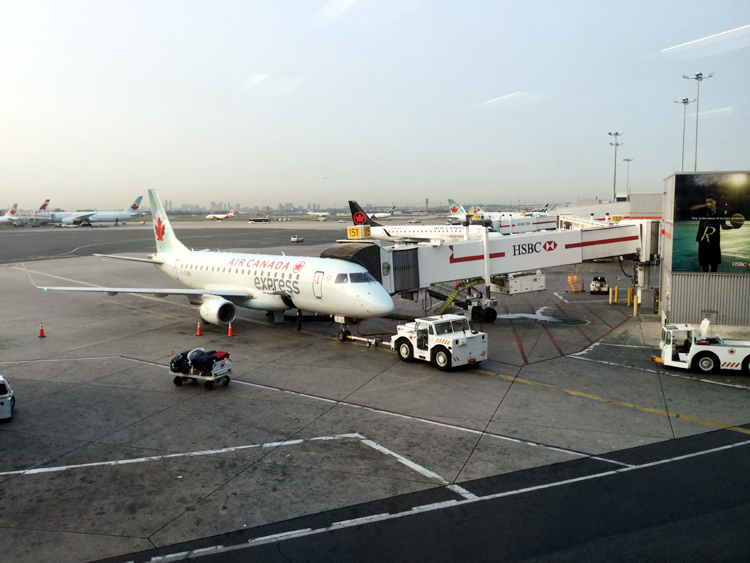 If you’ve read my post about the first day of my visit, you’ll recall that I was thoroughly impressed with how easy it was to get around the city via light rail, and that I’d taken it from the airport terminal to within a block of my hotel. 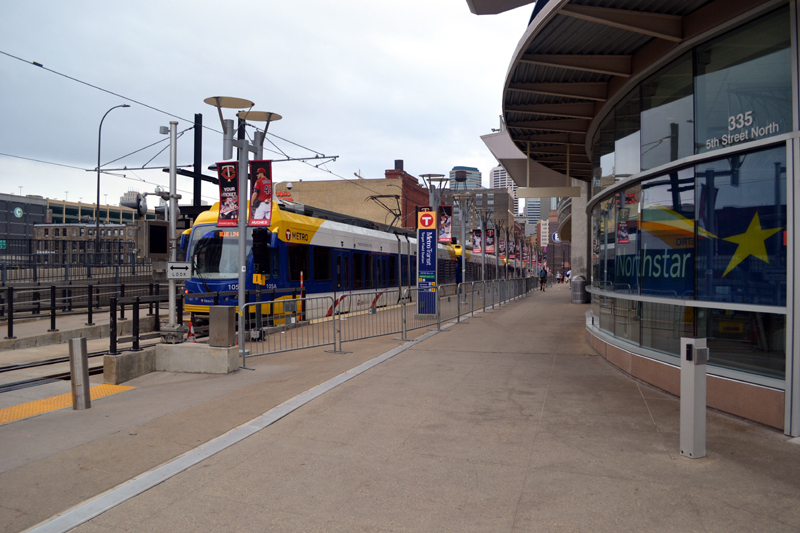 Target Field Station is where the Metro Blue Line ends, and I think it’s outstanding that you can so easily get to the ballpark in this manner. I like how it turned out, and I also like that the dark clouds soon went away and didn’t interfere with the ballgame! 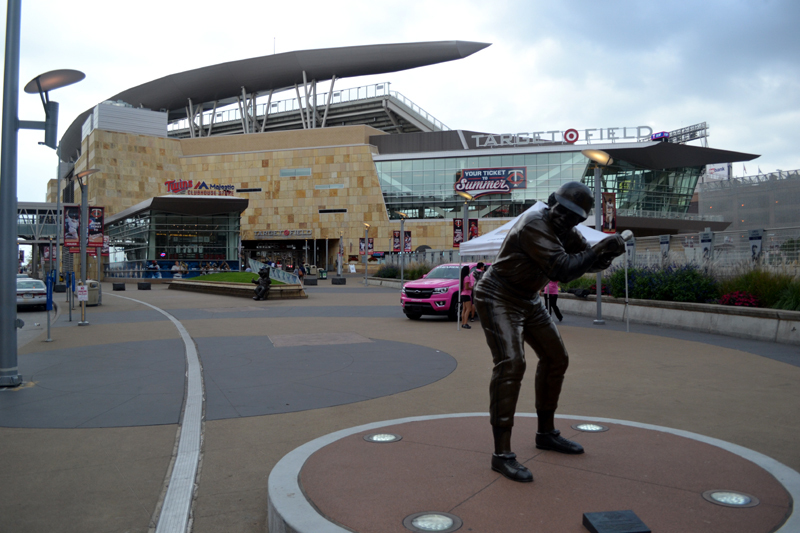 My last stop before entering the park was Twins Plaza outside Gate 34, which I’d enjoyed checking out a day earlier. 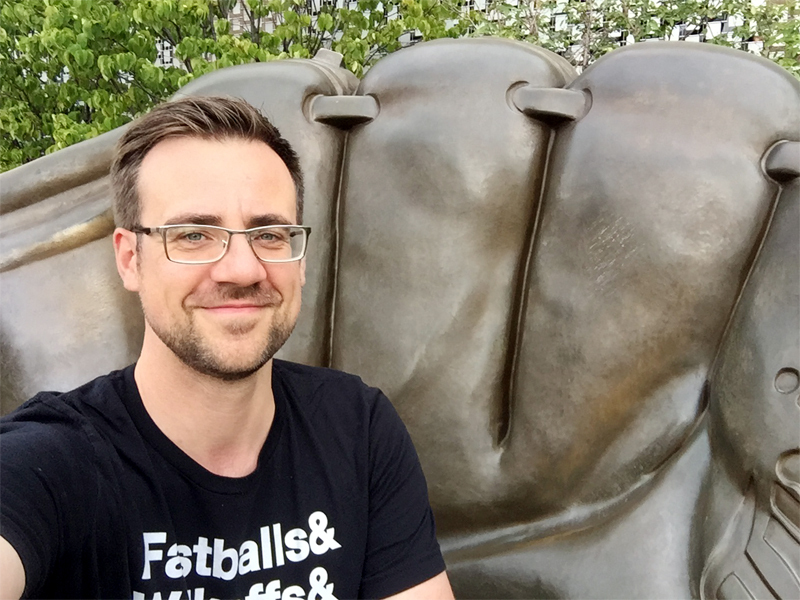 In addition to the Kirby Puckett statue, which I grabbed a photo with, you’ll likely recognize the statue called The Golden Glove. 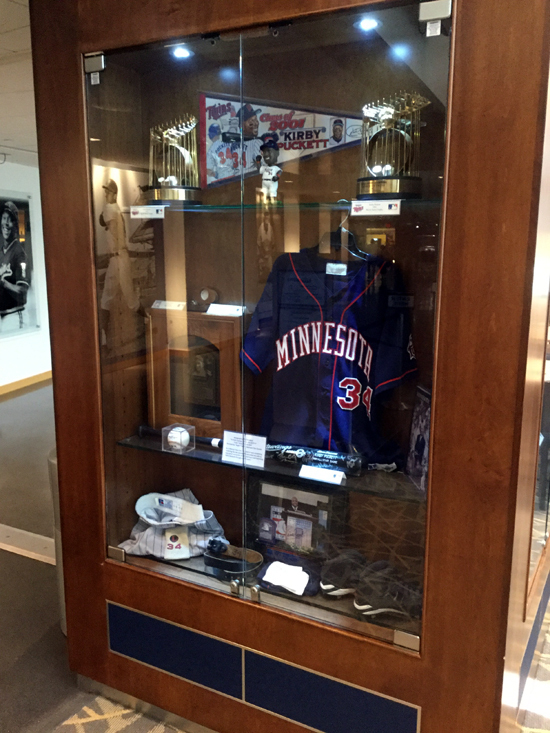 It was added in 2010 and recognizes the Twins’ Gold Glove winners. 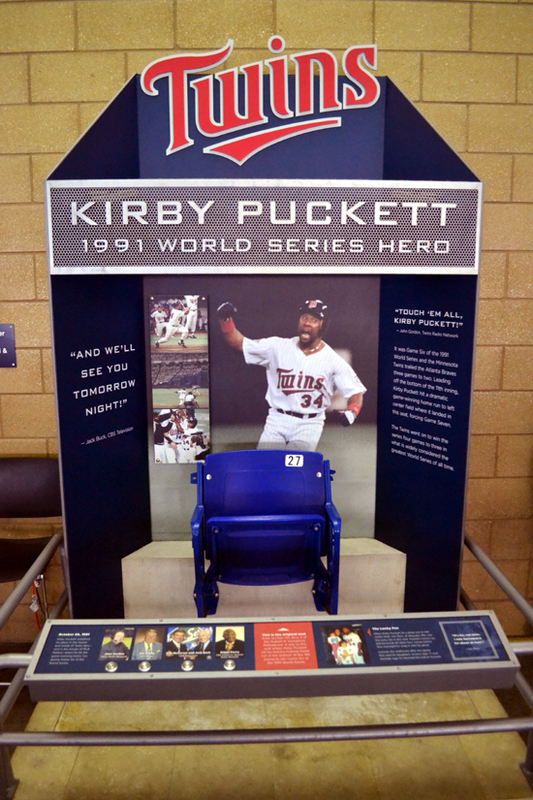 Lots of great names are honored on a plaque next to the glove — Puckett, Jim Kaat, Gary Gaetti, Tony Oliva, Torii Hunter and Joe Mauer, among others. 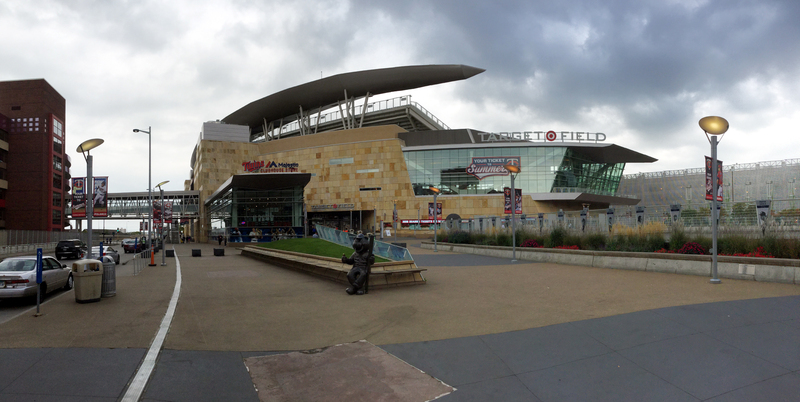 Want one more panorama before we head into the ballpark? Yes? I’m glad to hear it. 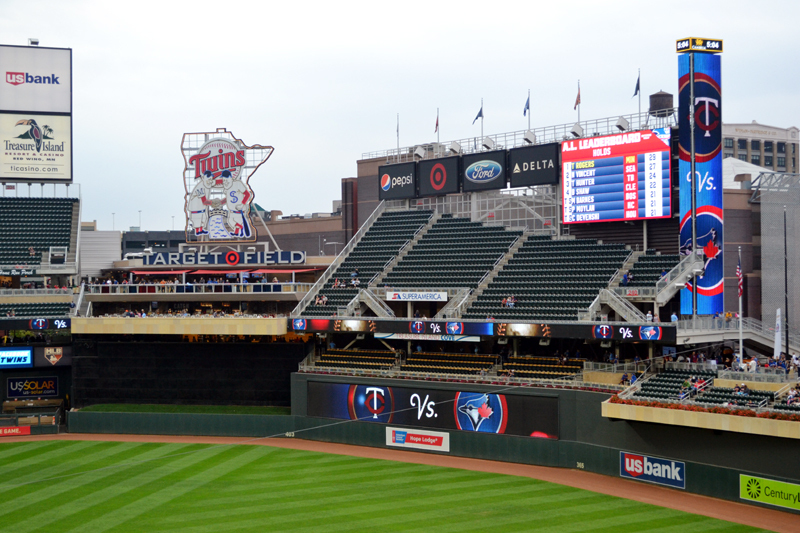 The Twins have one darned impressive-looking ballpark, don’t they? 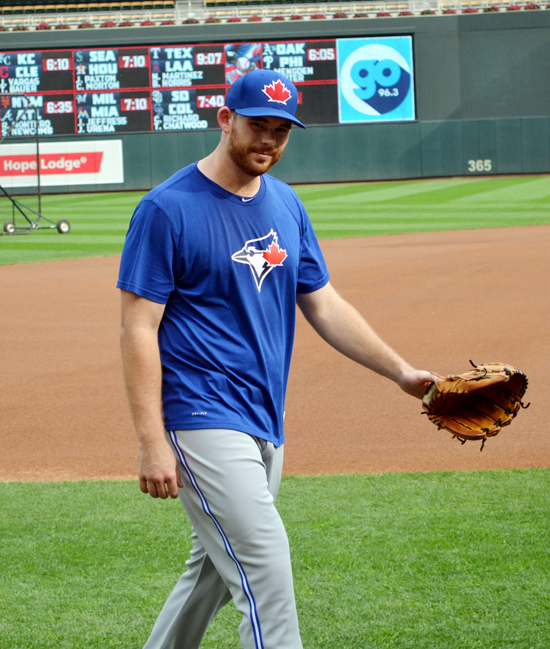 After watching the Twins for a while longer, I went over to the visitors dugout for the first time since a day earlier, where I watched a bunch of the Jays get loose. 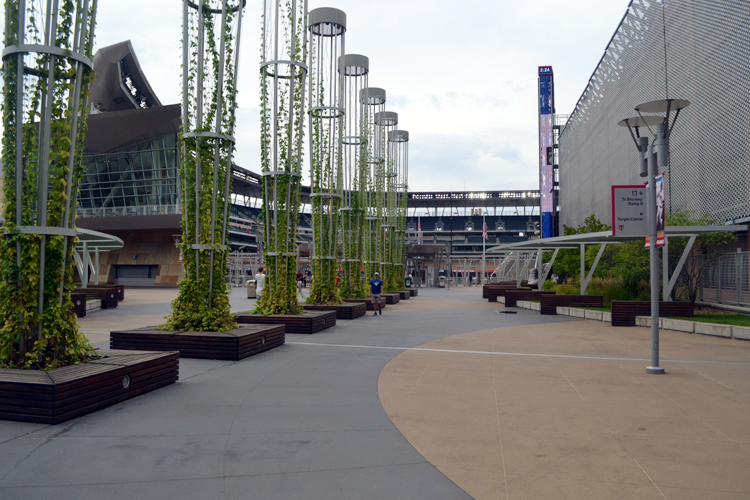 One of the things that really struck me about this ballpark was just how many different spots there were for fans to hang out and watch the game. The above image is looking in just a single direction, of course, but check out how many places there are for fans. 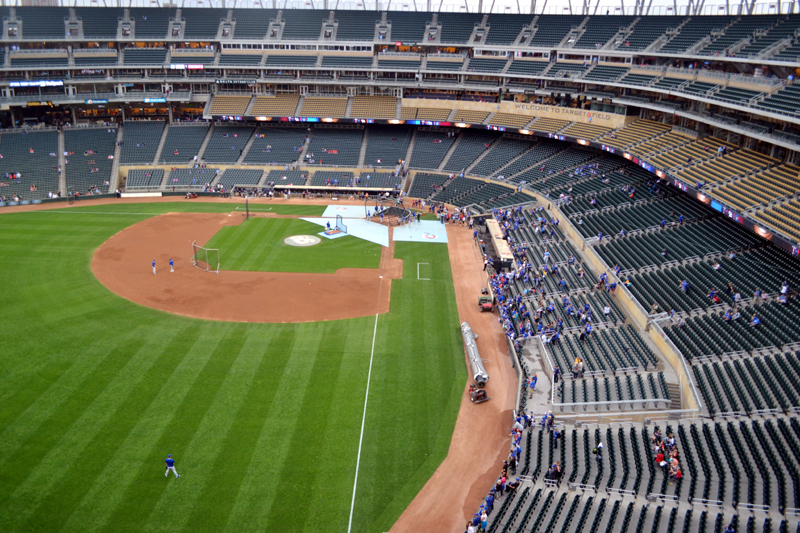 The main spot in this image is the upper deck in right-center, and I love how it’s asymmetrical in design. I spent some time in this area during each game I attended, and really enjoyed the view. You’ve got a smaller, more intimate seating section directly below that deck, as well as standing room behind it. 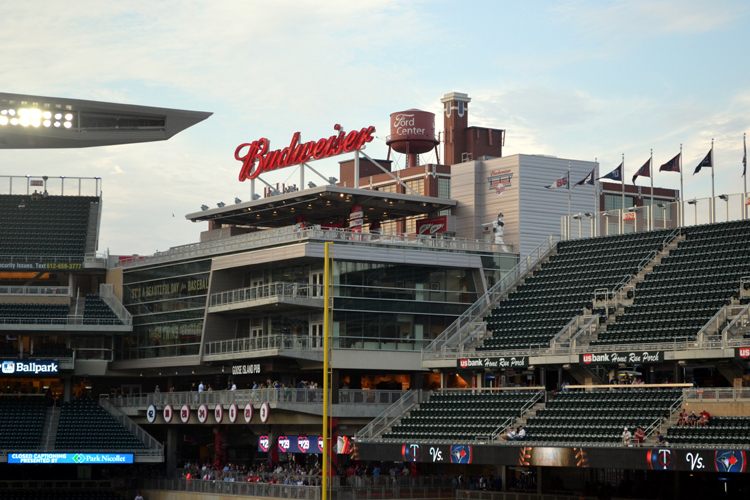 Moving toward center field, there’s the ultra-popular Minnie and Paul’s, a pub-style area that you can see directly below the Target Field sign. 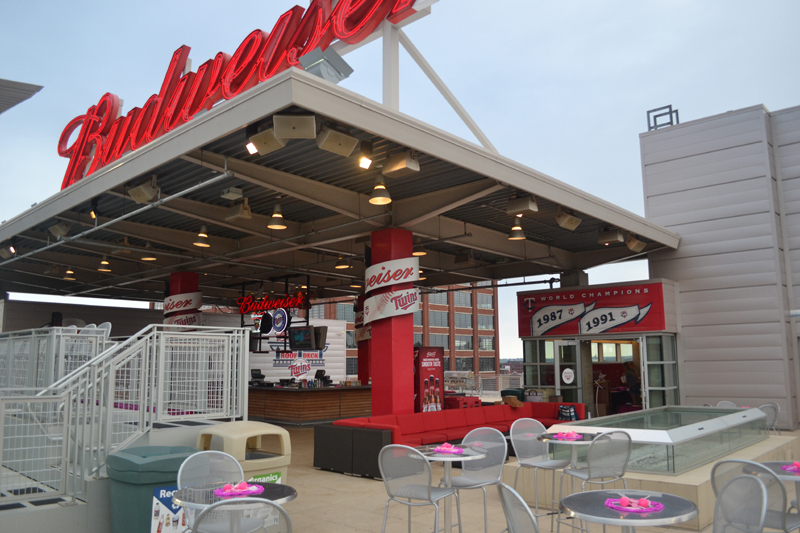 It’s got tables and chairs and standing-room spots, and is open to all fans. Directly below it is a premium seating area called Catch, which is limited to just 120 seats and includes high-end food with your ticket. And these are just the spots in a single photograph. 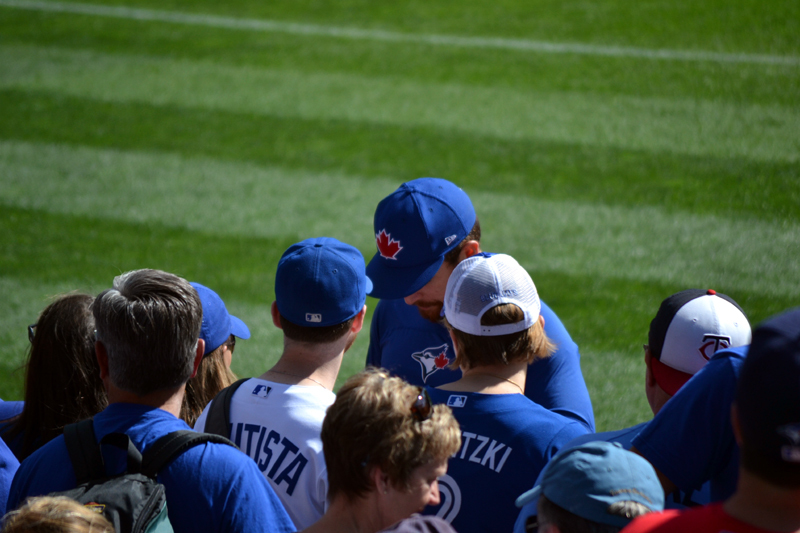 It seemed as though whatever direction I looked, there were many different spots for fans. 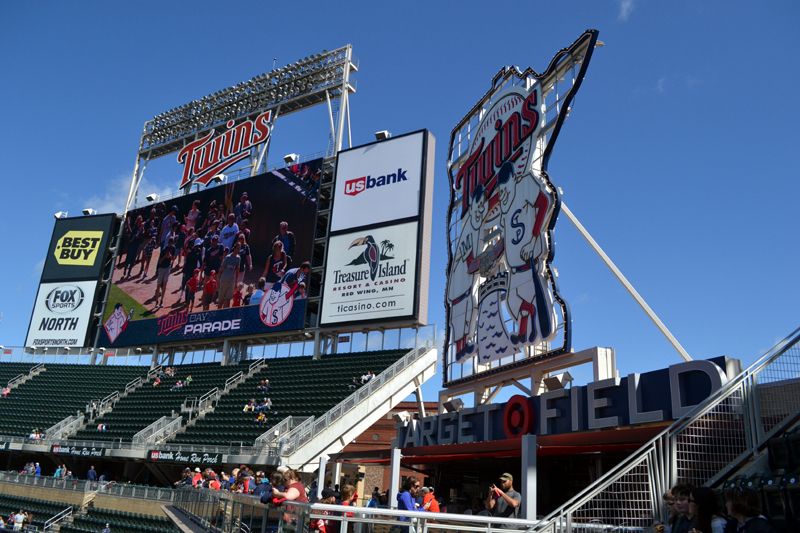 In the above image, the video board was showing an advertisement, but was otherwise airing the Twins pregame show, which I thought was a cool touch for fans to see as they got off the train and proceeded toward the gates. Shrimp boils aren’t exactly popular where I live in Canada, but I’ve seen them enough online that I’ve always wanted to try one. 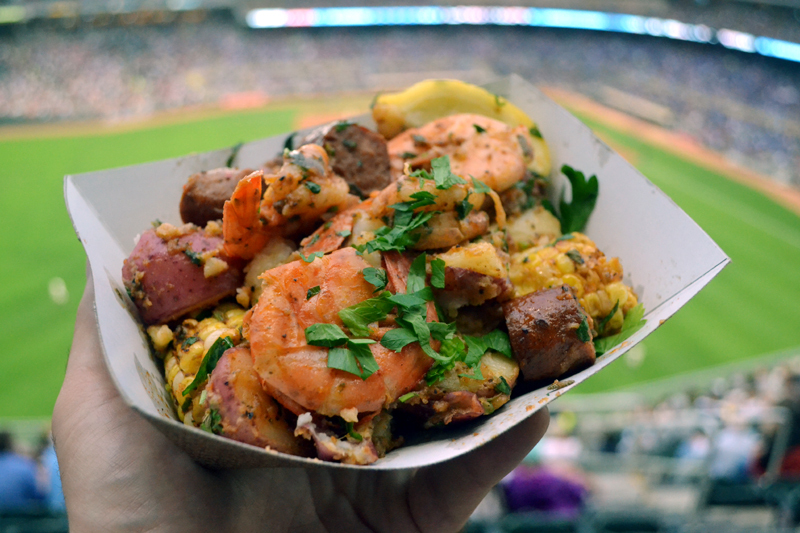 So, when I scouted out this item on the Target Field menu, I knew that I had to eat it at some point during my visit. At $14.50, this meal wasn’t cheap, but it also wasn’t small. It contained a hefty serving of shrimp, spicy sausage, corn on the cob segments and red potatoes, all tossed with creole seasoning. The verdict, I’m pleased to say, was freakin’ awesome. The variety of tastes and textures, all coated with the spicy seasoning, made this dish a real winner, and one that I had to fight the urge not to order a day later. In fact, it left such an impression on me that when I helped to put together the list for USA Today’s Best Stadium Food competition a couple months ago, I included it as one of the choices. 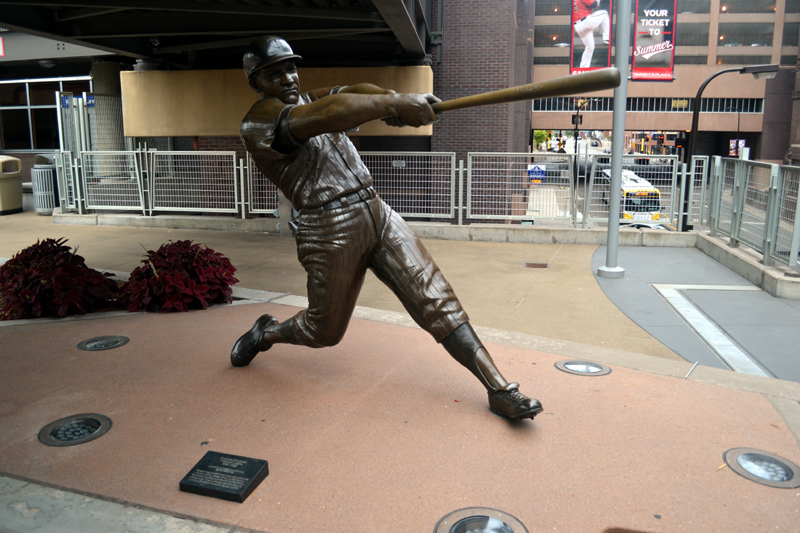 I spent a considerable amount of time browsing the hall of fame-worthy collection, which paid tribute to not only the top players and best moments from throughout the history of the franchise, but also to other key moments in Target Field’s history, including the various big concerts that the stadium has hosted over the years. 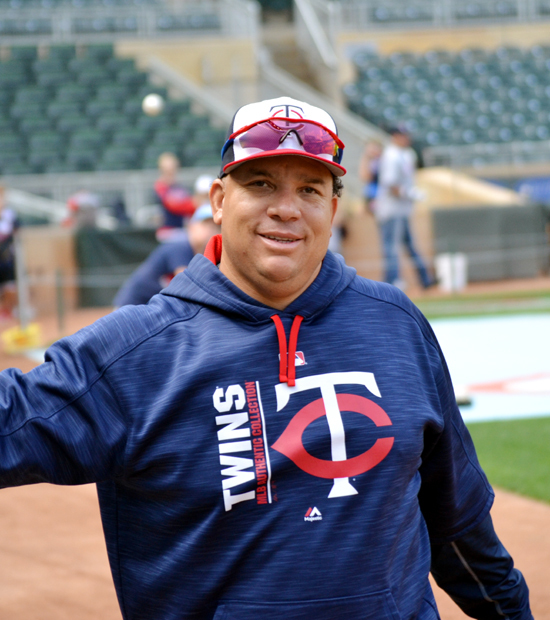 Just like a day earlier, I headed out of Target Field immediately after the final out and was back in my hotel room just a few minutes later, eagerly anticipating the Twins day game that I’d be attending about 12 hours later. When we woke up in Buffalo on the morning of August 7 last summer, it was the start of another exciting day. Day one of our August 2010 baseball roadtrip was down, but there were still a bunch of glorious days ahead. The plan was to have a quick breakfast in Buffalo, then make the three hour drive to Cleveland. Given this was a Saturday, the Indians played an evening game, but the plan was to get to Cleveland before noon, then have lunch and explore the city a bit. 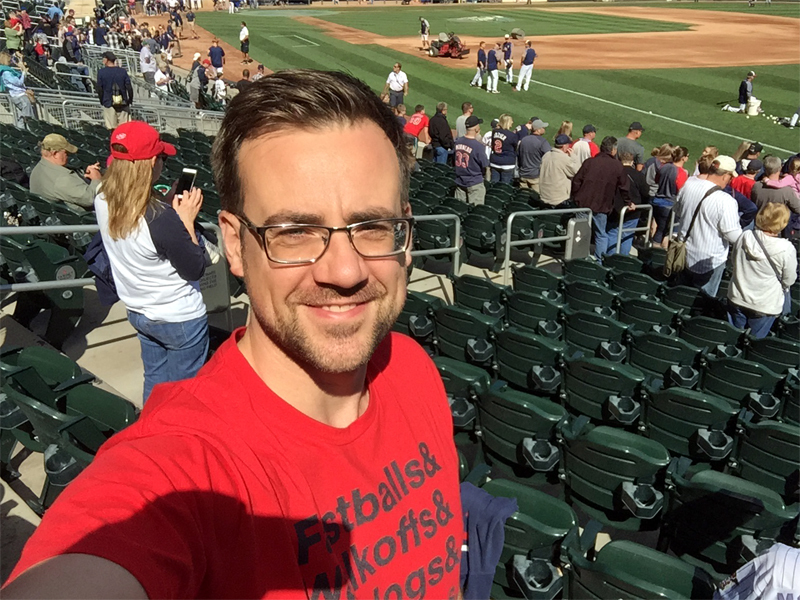 While I love baseball wherever it’s played, I was excited to see Progressive Field for the first time. This would be only my second MLB stadium and the home of the Indians looked amazing from what I’d seen. 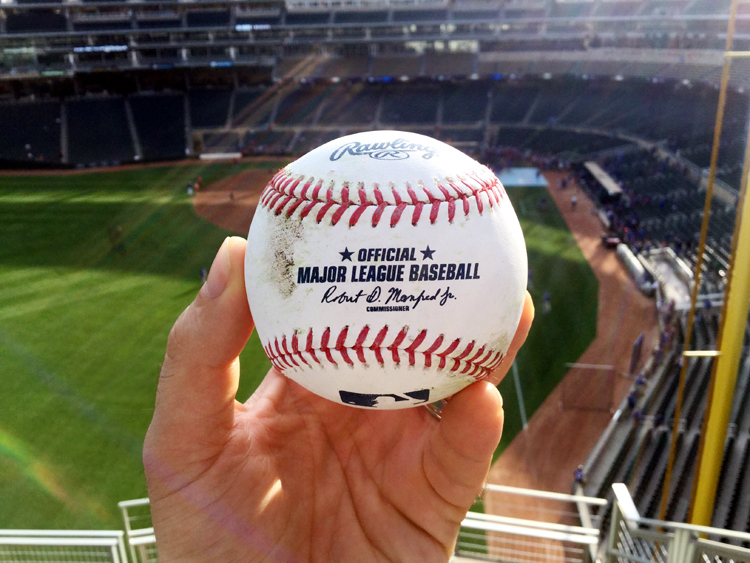 I’d bought left field bleacher tickets before the trip, but as always, the plan was to move around during the game. One neat thing about Cleveland is that there’s lots to do in a small area. Nearly within walking distance from the sub is the Cleveland Browns stadium and the Rock and Roll Hall of Fame. Progressive Field isn’t much farther away, and there’s a big area along the harbor, including a long pier, that we wanted to walk down. The traffic was psycho in this area because the Browns were having their first intra-squad scrimmage of the summer, and it was free for fans. See the traffic getting off the highway in the picture below? As tempting as that might’ve been, we headed to the area of Progressive Field and found a great covered parking garage for just $10. After parking, we loaded up my backpack and walked the two blocks to the stadium, passing by numerous illicit vendors hawking anti-LeBron T-shirts. My favorites? “The Lyin’ King” with a Disney’s Lion King motif, and “LeBron may be taking his talents south but his mom is still ridin’ West,” in reference to Mrs. James’ alleged relationship with LeBron’s former teammate Delonte West. I regret not buying some of these silly T-shirts, but I’m sure the vendors will still be out there next time I visit. Feller was an amazing pitcher and human being. I was fortunate enough to get his autograph on a baseball through the mail about a year ago. He would be in attendance at this game and unfortunately, he’s since passed away. For those of you who are wondering where my ticket shot is, I was so excited to get to this game that I forgot to take one. Never fear, though. I remembered the next day. 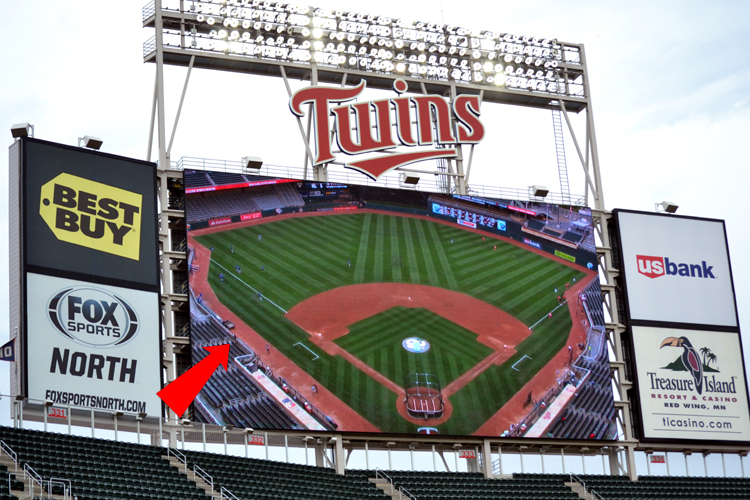 If a ball hits this area on the fly, it spins like crazy and can be pretty dangerous to people who aren’t paying attention. 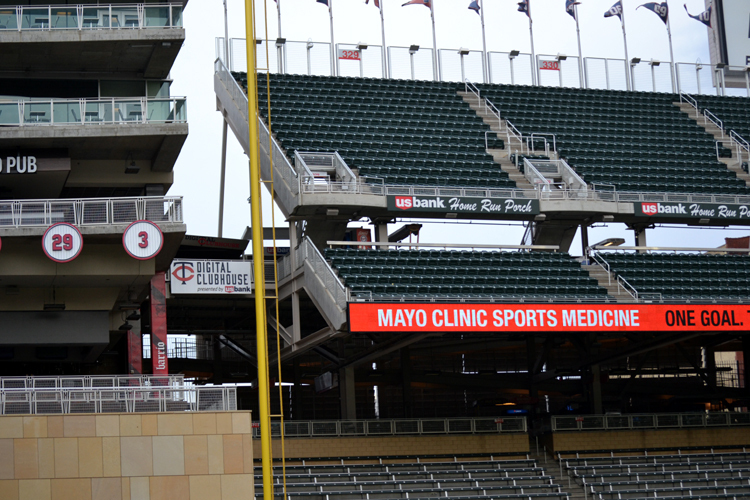 I should mention that when Gate C opens, fans are allowed only in the right field area for batting practice. 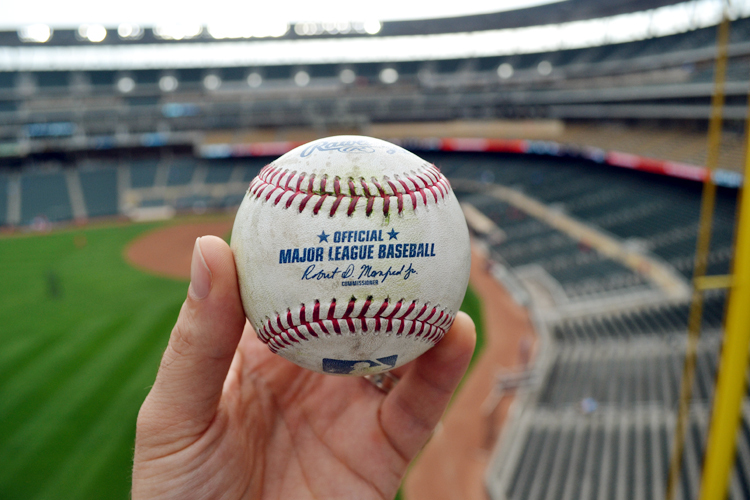 That means that some balls make their way to the left field bleachers and are typically scooped up by ushers. In fact, in the above photo, you can see the usher on the left looking for balls. Think those uniforms are neat? Wait until you see Minnesota‘s. I walked around a bit more and took some photos here and there. 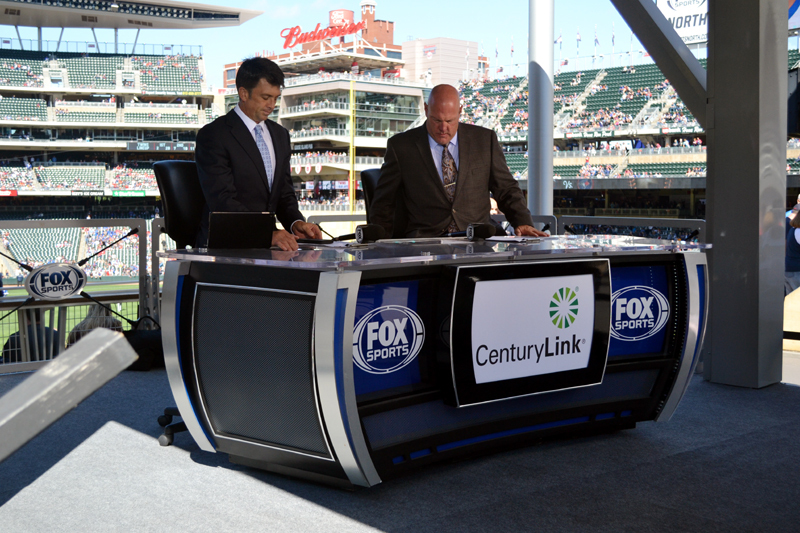 By now, it was getting close to game time and the pregame ceremonies were kicking off. 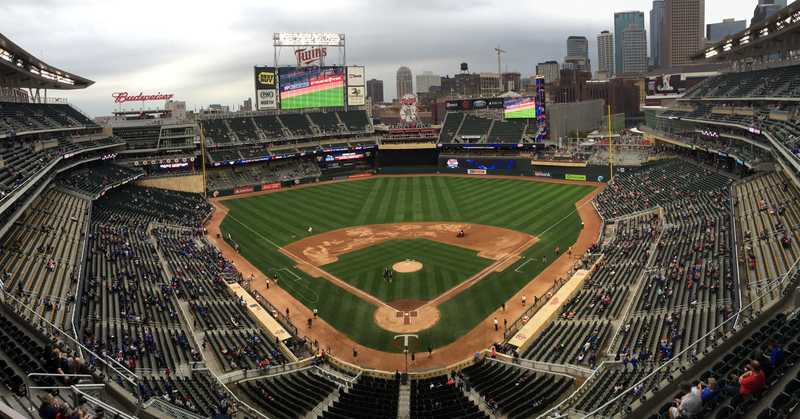 another Twins uniform shot (that’s Denard Span), a panorama from the top of the 100 Level, a look away from the stadium at downtown C-town and a sneak peek at the players’ parking lot. 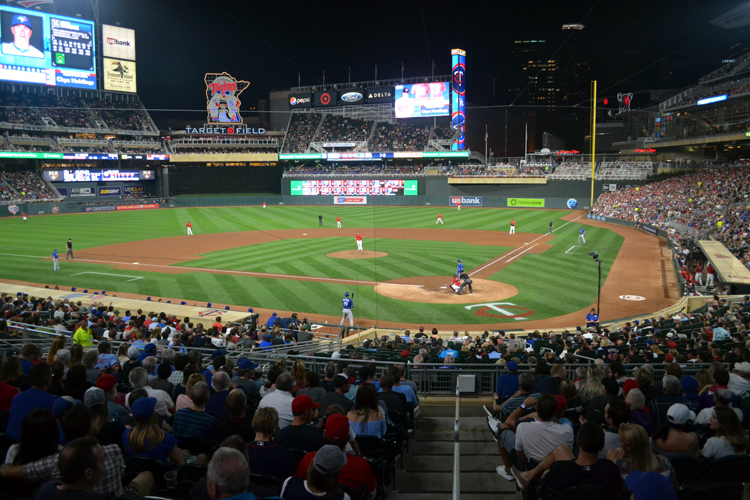 What a great night at the ballpark. 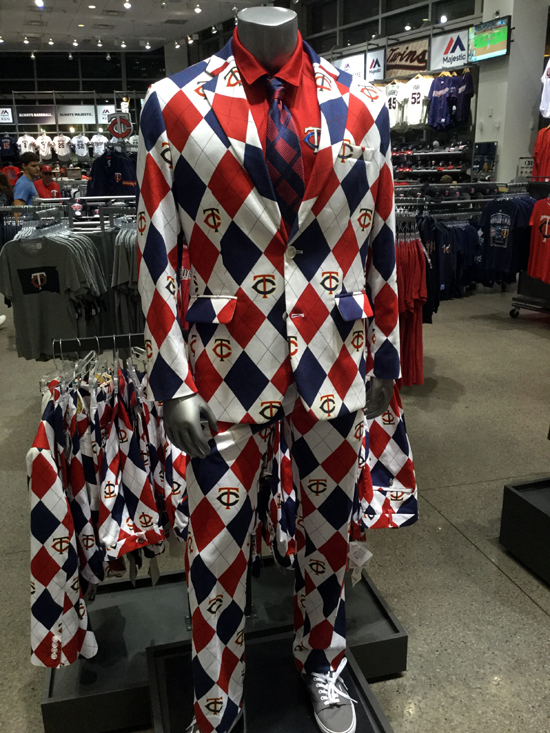 The Twins won 7-2, helped by the first career home run by Trevor Plouffe. 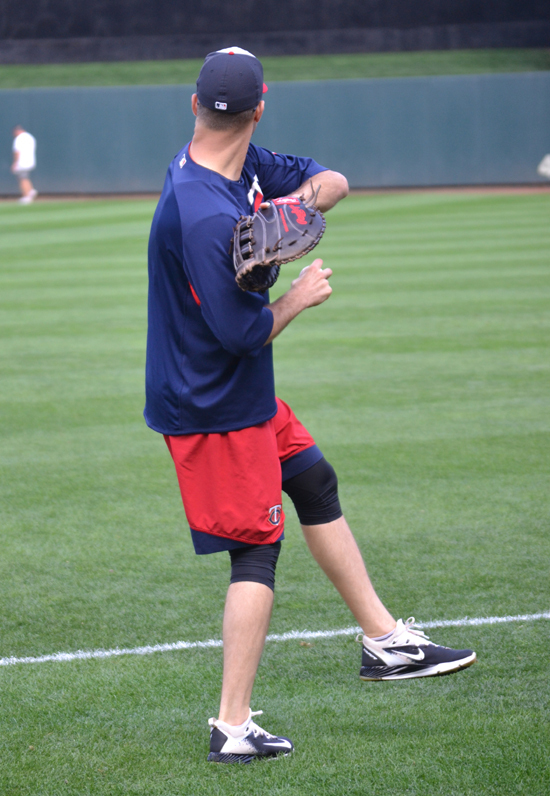 This was the second time I saw Plouffe in person last summer. 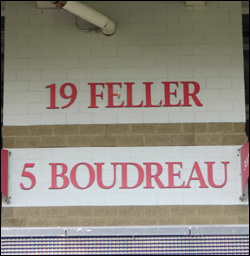 I also saw him on July 16, playing for the Rochester Red Wings in my first live ballgame of the summer. It was also my first stadium visited for my website, TheBallparkGuide.com. Good night, Cleveland. I’ll see you again in about 12 hours!